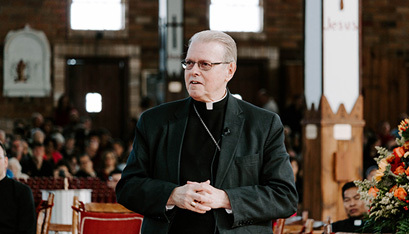 Bishop Edward B. Scharfenberger will celebrate a Mass mark­ing the start of national Catholic Schools Week in the ­Roman Catholic Diocese of Albany on Sunday, Jan. 27, at 2 p.m. at the Cathedral of the Immaculate Con­ception in Albany. Catho­lic school educators, friends of Catholic education, and community partners will be honored at the Mass. The unveiling of the Annual Diocesan Art Show at the Empire State Plaza, South Gallery, will immediately follow the Mass. The celebration of Catho­lic Schools Week and the art exhibit together allow the 22 Catholic schools of the Albany Diocese to tell their stories and share their talent. Student artwork will be on display through Feb. 1. Among those to be honored this year is Terri McGraw, consultant for curriculum, instruction, and assessment at the Catholic School Office. A dedicated Catho­lic educational leader, Mrs. McGraw has held many leadership positions throughout the Diocese of Albany, including principal of St. Ambrose School in Latham and assistant superintendent for curriculum and instruction. During her tenure at St. Ambrose School, she provided a safe, nurturing and spiritual environment while encouraging teachers to discover and nurture the unique gifts of each student. Her vision of a St. Ambrose Catholic community brought the school and church into a closer partnership for the benefit of all. Mrs. McGraw is a mentor to many, known for her patience, professionalism, vision and treating everyone with dignity and respect. Other awards to be distributed include the Community Partner, Teacher of the Year, and School Staff awards, among others.